" Traffic here is almost narrow and rampant by illegal parking"
South Jakarta Transportation Sub-dept. 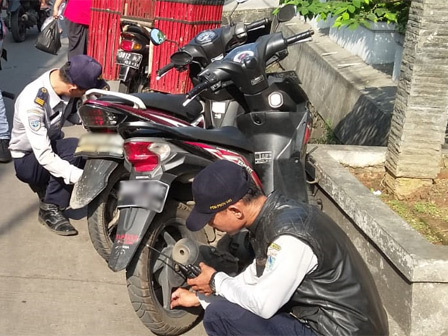 officers have cracked down on illegal parking in front of Minangkabau Market, Menteng Atas, Setiabudi. According to Christianto, Head of South Jakarta Transportation Sub-dept., his sub-dept. involves Satpol PP, police and army to optimize the operation. It is done to minimize traffic jam in the field. "Traffic here is almost narrow and rampant by illegal parking. This is what makes the jam," he expressed, Wednesday (5/30). In the field, 15 units of motorcycles were flattened. It is aimed to give deterrent effect towards the motorcyclists who park illegally on the roadside. "15 motorcycles are sanctioned in accordance with bylaw number 5/2014 on Transportation," he asserted. Meanwhile, Menteng Atas Urban Village Head, Zulkarnain admitted his side gets public complaints about illegal parking that triggers traffic jam. His side then coordinates with South Jakarta Transportation Sub-dept. to conduct the operation. "Especially in the morning and afternoon, we also deploy officers to handle illegal parking in the field," he told. "We urge those who will shop to the location not to park on the roadside, as we will continue to take firm action," he said.